In a previous post we saw that most of the time we are only using half of the circle at a time to figure out what happens in a particular key. 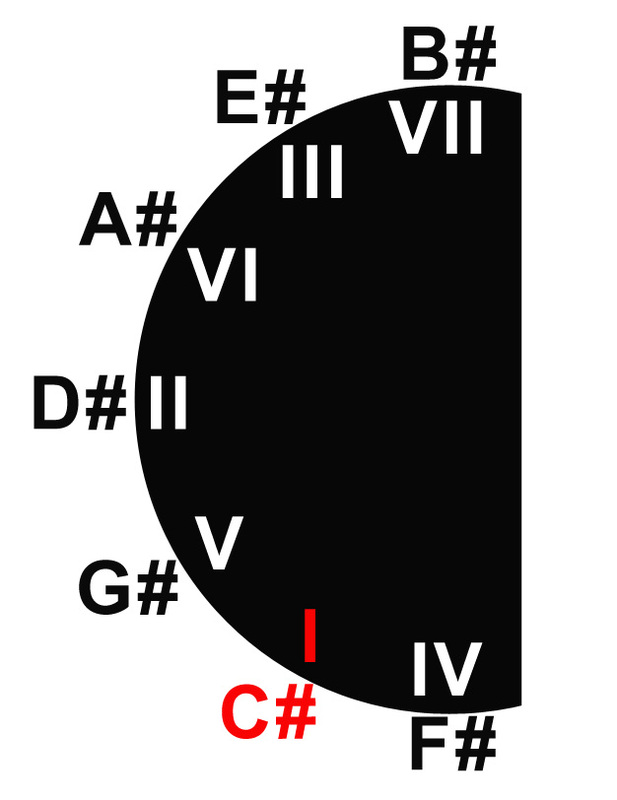 Here are the notes found in the key of C.
Using that concept, let’s look the other side of the circle and the key of C# Major. Again, we are only using half of the circle. You’ll notice also that the sharp side of the circle is laid out the same as the other half of the circle, i.e. G# is a 5th up from C# and so on. But we have to look at in a kind of upside-down way to see how it mirrors the other side of the circle. Looking at the sharp side of the circle in this fashion reminds me of my first time looking at the sky in the southern hemisphere. It looked the same as the sky in the northern hemisphere, but it was somehow different. Observation: Learn what happens in one key and you will know how to navigate your way through all twelve keys! I am thinking thr C# major scale on the circle here works if the C# and G# have accidentally swapped positions. Othewise it does not make sense to me.